HANSA’S – More than just a restaurant, Its my life! Book review of a unique new book of Indian vegetarian cooking from a multi-award winning master-chef! One of the unique facts about Indian culture is that it is one of the oldest unbroken living cultures of the world. At a time when the world is crying out for an ethical, peaceful, environment-friendly lifestyle, the solutions are right under our noses, but we fail to see and understand. Yes, in spite of our ‘civilisation’ and ‘education’, we are a largely ignorant species. Gujarati culture and food are at the heart of such lifestyle. 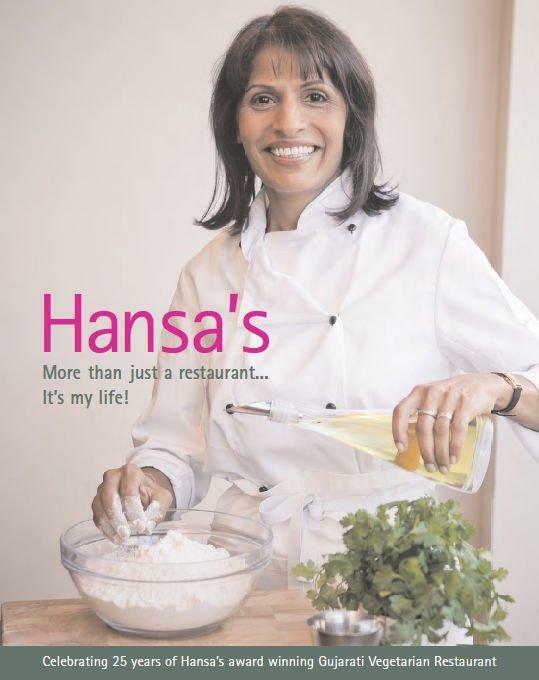 And Hansa’s latest book is more than a recipe book – it marks an enterprise which is holistic in its truest sense – her very life and passion come out through her food and service. There are very very few people in the world who can boast this way of living and seeing. And to think that her migration to Britain has made her even more passionate and authentic about her culture and values, and share them is a huge blessing to us all. The book is set out in 166 pages, with beautiful photos, recipes and illustrations. Hansa’s is a very successful grassroots vegetarian restaurant in the heart of Leeds, which has been in existence for nearly twenty-five years. It has built up a solid multi-award-winning reputation, mostly because it's ethos of service and passion first, and a business second. Among its customers are famous people like Kay Mellor OBE, Jean-Christophe Novelli (Michelin Star Chef) and actors, actresses and even politicians. Hansa’s is a women-run organisation, and in India, most women are genetic master-chefs. This fact is rarely known and celebrated in the West. Thus at this restaurant, you do not have one but several master-chefs. Some of the recipes in the book are credited to other colleagues, and the pictures suggest that the staff are all one happy family, united in their desire to satisfy the customers’ culinary desires, endeavouring to pass on their ethical spirits through the food they cook and serve. We all know that Indian food is the most popular ethnic food in this country, and there is an Indian restaurant in every locality all over Britain. However, the cuisine served here is different from Hansa’s – it is more fused and doctored to a standard British taste than authentic and unique. Furthermore, the attraction of Hansa’s is the way the book links culture and lifestyle to food. Food is not just a take-away or a culinary experience, but a statement about our own values, lifestyle and health. And eating at Hansa’s has inspired so many to come again and again, because it is an experience which touches the soul. The short chapter on Ayurveda (the science of prolonging life) is a great introduction to this 5000yr old holistic medicinal system, still being practiced widely in India even today. The chapter explains the concept of the Three Doshas or body-types which enables us to learn about our own characteristics and how to choose food items which will promote good health and control our own wellbeing. Many of the recipes are simple, quick and easy to follow. There are translations and explanations of any unique ingredients, and the pictures make you want to start straight away. Although there is a strong Gujarati influence, there are also recipes from South India and some East African influences can also be seen. There is some fusion and experimentation also. The main asset of the book is to have it as a practical guide, as an ideas resource when you have invited friends but do not know what to make, and the simplicity of the explanations. The modern world enables cultures to meet and connect. It provides huge opportunities for personal growth and development through these encounters. The choice of how we respond to these encounters, and how much of our effort we invest in understanding others, is entirely ours. Through my writings and consultancy on Diverse Ethics, I am opening these possibilities and encouraging more and more people to dig deeper and to learn and grow, rather than distrust and close their minds. Hansa’s book is one of the open doors - it is up to us how far we decide to take it. Dr. Atul Shah, Director, www.diverseethics.com. The book is priced at £14.95 and is available from Amazon and all good bookstores.